M. Jaynes is a nonfiction writer living in the Southeastern United States. His work focuses on nature, animals, and the environment. 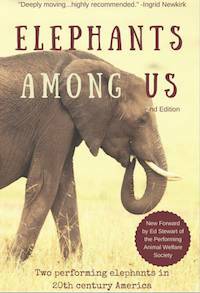 NOTE from the author: We are proud to present this second edition of Elephants Among Us. The first edition (blue cover) is out of print though used copies are available online. Nonetheless, buying this new edition is highly recommended. It has a new forward from Ed Stewart of the Performing Animal Welfare Society, and it is priced more affordably. The second edition is available in print and digital formats and is currently exclusively offered through Amazon.com and the Kindle Direct Publishing.